Theme: Learning from past MALiA Innovation Grant winners. Assorted pastries, juice, and coffee will be available in the morning. Lunch will be off-campus. Feel free to explore some of the great local options Abingdon has to offer! For any questions, please contact Emily Correa, ebcorrea@co.campbell.va.us, 434-332-9658. The next MALiA Youth Services meeting will be April 5th at 10:30am at the Salem Public Library. Lunch will be sponsored by MALiA. 10:30am – Discussion of SRP triumphs and failures, 2018/2019 MALiA budget and more! The MALiA Spring Meeting will be June 8, 2018 at Brevard College. 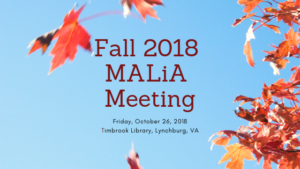 Please join us for the next MALiA Youth Services meeting on Friday, April 13 at the Montgomery-Floyd Regional Library in Christiansburg at 10:30am. Funding Requests – if you’ve put together a successful funding request letter or simple grant application lately, please bring a copy to share with the group or email me. Please RSVP by Friday, April 6. Brodart Books and Library Services would like to offer MALiA members access to a webinar to introduce you to their services, the discounts they provide within our current contract with them, and their online ordering and collection development tool. Please see the following information below from their company and contact your Brodart representative to rsvp for the webinar if you would like to learn more about what they have to offer. The contact information for your area representative can be found under Brodart’s link on our library materials contracts page. Their company will also be sending individual email invitations for the webinar to MALiA members. Brodart Books & Library Services is the premier supplier of shelf-ready materials to libraries, delivering carefully selected, cataloged and processed books. With over 250 combined years of experience working in and with libraries, our Collection Development experts have an extensive knowledge of industry trends and services. We focus strictly on libraries’ needs to provide customized services, from selection to shelf. Brodart offers state-of-the-art online tools, bibliographic services, and consulting exclusively to libraries. We’ve partnered with MALiA to provide the most cost-efficient, value-added services available to its member libraries. As a service to its members, we will be hosting an informative webinar to review this partnership, the discount program, Bibz, Brodart’s online ordering and collection development tool. Current Bibz users will benefit from this webinar; we’ll be reviewing Bibz enhancements, upgrades, and all-new tutorials! The next MALiA Youth Services meeting will be held at Bristol Public Library on Friday, November 17 at 10:30am. The guest speaker will discuss 123 Read.